This post shows how to move data from a SQL database to GRAKN.AI as well as how to use the GRAKN.AI visualizer to explore the data. Highly interconnected data from complex domains is challenging to model, maintain, and query. With GRAKN.AI, which is an open-source distributed knowledge base (think a graph database with an extra punch), building intelligent systems becomes dramatically easier. If you are thinking of trying GRAKN.AI, the chances are that you already have some data and want to see what our stack can do. This post shows how to move data from a SQL database to GRAKN.AI, and how to use our visualizer to explore the data. I have used MySQL for this example, although the Grakn Labs team has also tested with Oracle and PostgreSQL. The version of GRAKN.AI I used was 0.12.1 but, as always, I recommend that you use the latest version. As you can see, there are 5 columns in the table (confusingly shown as rows in the output): ID, Name, CountryCode, District, and Population. The ID is the Primary Key for the table, which uniquely identifies each record. This will be important later when we migrate to Grakn. Let’s get the information about a specific city: Sydney, Australia. There are limitations on the SQL format that prevent it from expressing the semantics of the data. By “semantic,” I mean that the meaning of the data cannot easily be encoded alongside the data itself. In contrast, a knowledge graph is self-descriptive, or, simply put, it provides a single place to find the data and understand what it’s all about.To have the full benefit of a knowledge graph, we must write the ontology for the dataset. Then, to insert a relation between the language and the countries in which is is spoken, there is a match-insert query that matches a language and country, then builds a relationship between them. Whether you use the shell script or Java code, what you are doing, in either case, is extracting SQL data using the JDBC API and importing it into a graph. One issue that I hit on initially is that you need to make sure that you download the JDBC driver from here and place the JAR file (mysql-connector-java-5.1.40-bin.jar) in the /lib directory of the Grakn environment that you downloaded and set up. 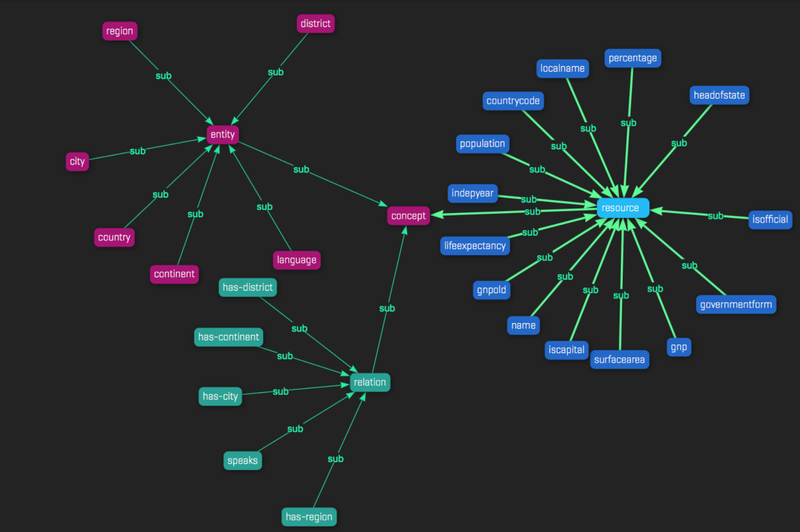 The Grakn visualizer is a cool way to look at the resulting graph and explore the data. With the Grakn engine running and the graph loaded, in your browser, navigate to http://localhost:4567/ which will allow you to make queries on the graph. It’s a nice way of seeing how data is connected, which fits much better — in my view — with how I think about cities and countries, than a table with rows and columns. Let’s explore. 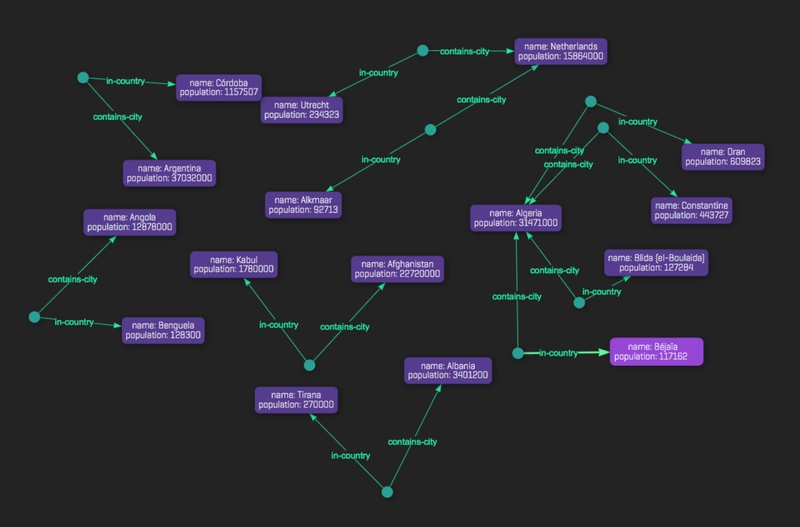 At the beginning of this article, I introduced GRAKN.AI as a graph database with extra punch. I have hardly scratched the surface of what it can do, but I hope I have at least shown that it is easy to set up a Grakn graph with familiar data, and how to query and visualize it. This article was originally posted on the GRAKN.AI blog.